Matthew Saldivar (#6), a Collinsville student who is battling cancer, led the Cardinals onto the field Friday night along with some of his friends ... and was an honorary captain for the coin toss. The Collinsville Cheerleaders went with the gold theme for the evening with their outfits. They were also honored for being named the 5A Cheer Academic State Champs (with a 3.89 GPA average) ... for the 2nd year in a row. They will compete Saturday September 26th at OSU for the 5A cheer 2 minute routine competition. Josh Arnold (#43) and Jacob Harrison (#51) combined for a sack on this play in Coweta's first possession. Collinsville's first possession started at Coweta's 26 after a punt and ended with 8 minutes left in the first quarter when they turned the ball over on downs when they failed to convert a 4th and 12 from Coweta's 28..
Roc Robbins (#44) knocked the ball loose from the Coweta ball carrier to end Coweta's second possession (below). Jacob Harrison (#51) came up with the fumble recovery and a big smile to put Collinsville on offense at Coweta's 24 yard line at 7:30 in the first quarter. Quarterback Seth Boomer was marked out at the 3 yard line on a 24 yard keeper setting up the TD below. Sheaffer Smith (#25) reached the ball into the endzone (from the 4) for the first points of the game at the 6 minute mark of the first quarter. Cole Hadley's kick was good and the Cards led 7-0. Coweta completed this pass (with no penalty) despite the double team on Roc Robbins (#44) which included what looks like a hand to the face by one player and a neck tackle by the other in the first quarter. Coweta scored 20 unanswered point in the 2nd quarter. Their first TD was a throwback to the QB at 10:05, the second was a 73 yard pass at 8:05 (following a play where Collinsville nearly recovered a fumble), and the third was a 45 yard run breaking several tackles with 3:42 left in the half. The Crimson Cadet Band entertained at halftime. Seth Boomer (#12) brought the Cardinals to the line just inches from the goal early in the 3rd quarter. 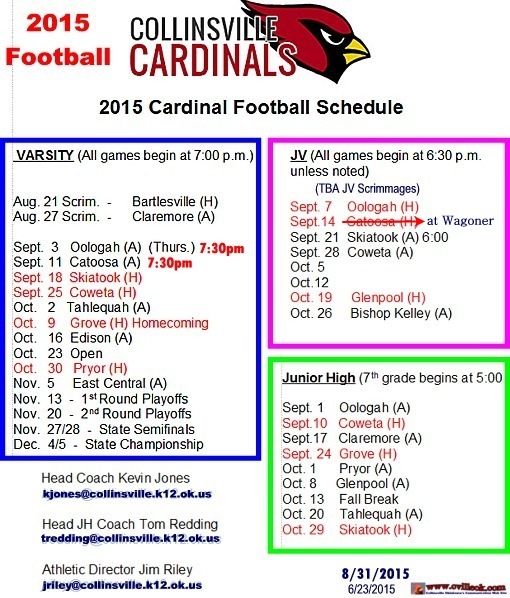 An Austin Roberts punt had pinned Coweta at their 5 and Collinsville recovered a fumble at the 6 on the next play. Two Sheaffer Smith runs had the ball nearly to the goal line but the Cards had a loss and were then short at the one yard line on 4th and goal at 7:26 in the 3rd quarter leaving the score at 7-20. Brandon Lowe tossed this touchdown pass to QB Seth Boomer (below) after Boomer handed off to Sheaffer Smith who handed off to Lowe. This got the Cards to 14-28 in the 3rd quarter. Collinsville had given up 28 straight points before this play at 2:41 in the 3rd quarter. The play covered 7 yards. Passes to Brett Erickson were key in the drive. This touchdown catch by Seth Boomer (#12) made the score 14-28 after Hadley's extra point kick. Sam West (#13) strided into the endzone with a pass from Seth Boomer on a touchdown play covering 50 yards on the last play of the 3rd quarter. Hadley's kick got the Cards to 21-28. Seth Boomer (#12) scored on a 50 yard keeper (at 10:58 in the 4th quarter) one play after Collinsville recovered a Coweta fumble at midfield. Cole Hadley tied the score at 28-28 with his extra point kick. After Coweta had regained the lead at 28-35 on a TD pass from mid-field (at 9:58 in the 4th quarter), Sheaffer Smith (#25) got close but not quite into the endzone on a drive from the Collinsville 36 (with multiple passes to Hayden West). Coweta ended the drive with an interception at the 1 yard line below with 2:36 left in the game. Gold Out Night this Friday!! Deirdre Stock, a member of the CCC Band's color guard and a cancer surviver, joined Matthew Saldivar for the halftime ceremony to raise awareness for families of children with cancer and the work of Hannah's Helping Hands. There was also a release of gold balloons.